As I walk through boatyards, I routinely look at many details, everything from proper, and often not-so-proper, blocking and jack stand use, to the presence, or absence, of foot mats at the base of ladders. I also look closely at the bottoms of vessels to see how antifouling has been applied or is holding up. When bottoms are being prepared or painted, I watch the process, noting whether it follows manufacturers guidelines and industry best practices. WHAT CAUSES ANTIFOULING PAINT FAILURE? Recently, I’ve followed a thread on an owner’s group website regarding the “failure” of antifouling paint. It’s a subject I’ve encountered and had personal experience with many times in my career. The frequent initial reaction involves blaming the manufacturer of the paint, which is only natural. In some cases, it is indeed defective; several years ago there was a well-publicized case involving widespread failure Dolphinite’s Go Fast antifouling paint, the product simply failed to work, at least for boat owners. It was very popular with barnacles; they colonized vessels applied with it readily. Ultimately and regrettably, the problem resulted in a class action lawsuit, culminating in Dolphinite filing for chapter 11 bankruptcy protection. Fortunately, that example is the exception. In many other cases, the “failure” involves paint’s inability to adhere to the vessel’s bottom, exposing substrate, which ultimately has the same effect—barnacles and other marine growth are able to strike on the bottom. I’ve encountered this scenario on countless occasions, and I see it routinely as I walk through boatyards. 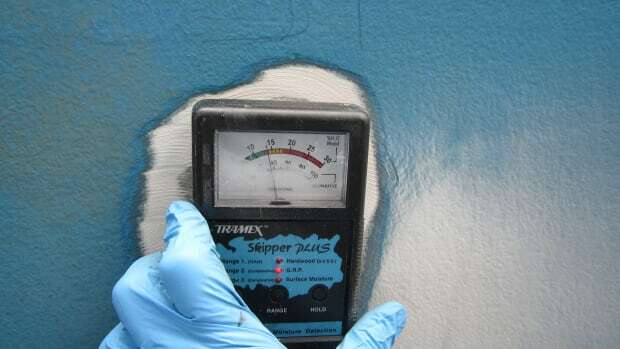 The bulk of the failures are the result of improper preparation, i.e., the surface over which the paint is applied is contaminated or it lacks the necessary profile or roughness to provide antifouling paint with the grip it needs. Contamination can take many forms, incomplete removal of growth, wax from topsides, or most insidious of all dirty wash water. The latter is often a result of improperly maintained recycling systems that filter water used for bottom pressure washing. When this occurs, a fine patina of dirt is left on the bottom as wash water dries. Painting over this often results in adhesion issues. If your bottom is washed with a pressure washer that relies on recycled wash water, then it’s worth taking the time to wash the bottom with clean, non-recycled water before it dries. It’s often easy to see where the release is occurring, if it’s between subsequent layers of antifoulant, then cleanliness or contamination are likely an issue, or it may be a simple case of paint incompatibility. In the case of a vessel that’s already in service, it’s important to ensure that the paint you have selected is fully compatible with the paint that’s already there. There are several antifouling applications worthy of discussion. If antifoulant is being applied for the first time, to a virgin gelcoat hull, there are several approaches that may be used. At one time, many new boat dealers relied on a chemical primer that is applied over the gelcoat, over which antifoulant is applied. Often referred to as “no-sand” primer, it was desirable in that it reduced the labor necessary to prepare the hull in that a primer that is applied, without the need for sanding the gelcoat. In a case of there being no free lunch, in my experience, no-sand primers are less reliable than primers that require sanding, the latter are afforded a mechanical grip on the surface. Just to keep it interesting, some new boatbuilders frown on sanding gelcoat because they rely on it as a moisture barrier, and sanding it necessarily reduces its thickness, and the thickness affords it greater resistance to moisture penetration. Gelcoat is marginally effective at best as a below-the-waterline water barrier and prophylaxis against osmotic blistering, and as such the admonition against sanding is worthy of some debate, gelcoat may slow down water penetration, but it’s unlikely to prevent it. Today, while still available, no-sand primers are less common and, fortunately, many builders have gone to vinyl ester resin, which is used to skin-coat bottoms, providing them with an effective osmotic blister preventative that doesn’t rely on gelcoat. A preferable alternative to no-sand primer relies on a two part epoxy primer/barrier coat that is applied to new gelcoat or exposed fiberglass (in the latter case, a bottom that’s been stripped of paint and gelcoat, for instance). Most epoxy primers require multiple preparation and application steps, some of which are especially time sensitive, and all of which must be followed to the letter in order to avoid failure. Notable among these are the need to de-wax gelcoated surfaces thoroughly and then aggressively abrade with 80-grit sand paper. All gelcoat is contaminated with wax; it’s used in the mold release process. If it’s not removed before primer or other coating application, it will cause adhesion failures and if it’s not removed before sanding, it will be pushed deeper into the surface, once again leading to adhesion issues. The goal is to provide the necessary clean “tooth” for the primer to hang on to. If the surface is too smooth, nothing will stick to it (except barnacles of course). Epoxy primers can often be used as just that, a primer for antifouling paint or a barrier against water penetration. Often, the only difference between the two is the thickness, barriers often require 10 mils dry film thickness in order to be effective, while a primer may be only half that. The next step is critical; where applicable it involves ensuring a thorough chemical bond between the antifouling paint and the primer. Achieving this bond is crucial in that it is very effective and truly does negate the need for sanding the epoxy primer before applying antifoulant. If the window is missed, in warm weather it may be as short as five hours, and the applicator neglects to sand the primer, the antifouling paint is likely to release some time thereafter. The release delay is the clincher; it may take months, usually after the yard period is a distant memory. The first reaction is often to blame the antifouling or primer manufacturer (ideally, from a compatibility point of view, they should be the same). Finally, when applying ablative antifoulant—my preference because it eliminates troublesome paint build up—in order to avoid exposing cured primer after the vessel is back in service, which often then necessitates sanding to achieve a mechanical rather than chemical bond, use a different color for the first coat, red for instance, and another color, say blue, for successive coats (initially, three coats are preferred). As the paint sloughs off, you’ll know it’s time to reapply as soon as you can see the red indicator coat. If you are doing any of this work yourself, be sure to use the required safety gear—a respirator, goggles, gloves, and coveralls. There’s a reason antifouling paint discourages growth; it’s nasty stuff and so are most two-part primers. Ultimately, like so many other multi-step procedures in the world of boatbuilding, repair, and maintenance, the instructions of the products’ manufacturers must be carefully followed—doing so will significantly reduce the likelihood of failures. In a future column I’ll discuss various methods of antifouling paint removal.